You can now start tweeting with the latest Twitter App for Windows Phone and stay connected to your friends and on what is happening in the world. If you’re using other Twitter app, time to replace that one with this latest and official Twitter app which is now on version 2.2.0.0. No need for you to pay a social Twitter app on your phone as it is free to download at Windows Phone store. Enjoy this more improved and more features version of Twitter that runs on Windows 7.5 and 8 OS. Follow your interests, browse, and search in one all-encompassing timeline. Watch the world unfold as never before. Get an insider view with behind-the-scenes perspectives. Find real-time stories, conversation and ideas, wherever you are. Share your views and ideas with beautiful photos, videos, and comments. Enjoy your Retweets, favorites, follows, mentions and replies in the Connect tab. 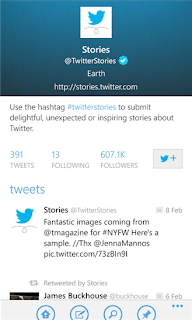 Source and download Twitter App for Windows Phone here.